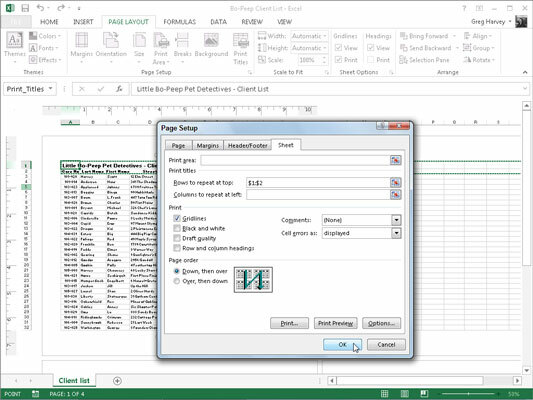 Excel 2013’s Print Titles feature enables you to print particular row and column headings on each page of the report. Print titles are important in multipage reports where the columns and rows of related data spill over to other pages that no longer show the row and column headings on the first page. To designate worksheet rows as print titles, go to Step 2a. To designate worksheet columns as print titles, go to Step 2b. Below, the Collapse/Expand button was clicked associated with the Rows to Repeat at Top text box and then dragged through rows 1 and 2 in column A of the Little Bo-Peep Pet Detectives – Client List worksheet. 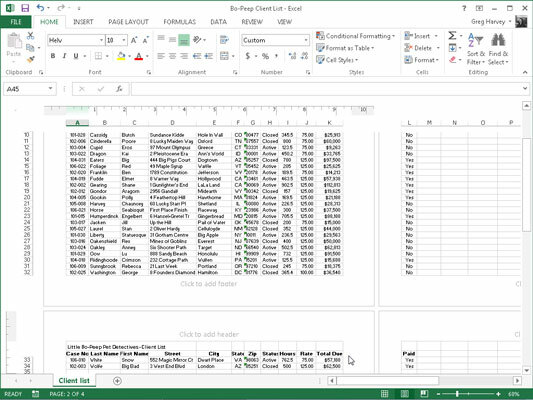 Excel entered the row range $1:$2 in the Rows to Repeat at Top text box. Rows 1 and 2 containing the worksheet title and column headings for the Little Bo-Peep Pet Detectives client database are designated as the print titles for the report in the Page Setup dialog box. Here, you can see the Print Preview window with the second page of the report. Note how these print titles appear on all pages of the report.